The R-27 ( Navy index 4K10, START designation PSM-25, classified by the United States and NATO - SS-N-6 Mod 1, Serb) was a Soviet liquid single-stage ballistic missile complex D-5, placeable on SLBM submarines of project 667A and 667A. 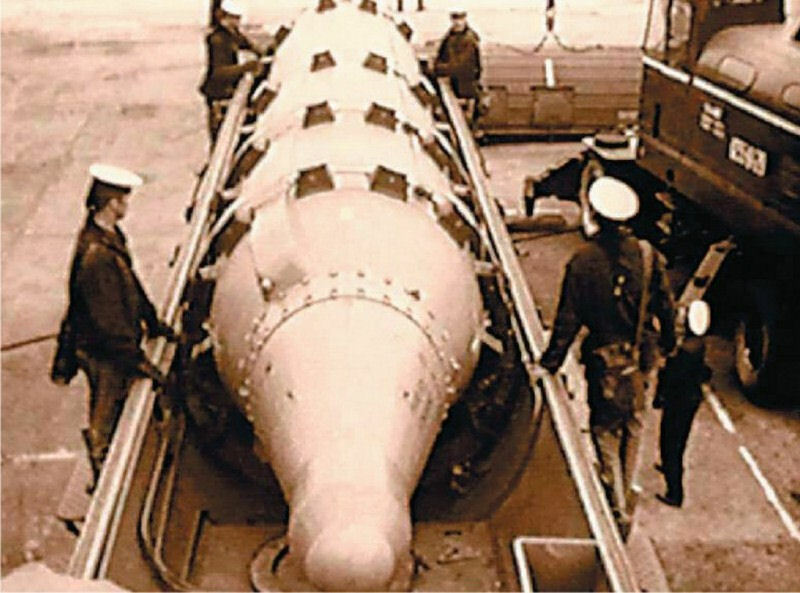 The missile was developed in SKB-385 under the leadership of V.P. Makeeva from 1962 to 1968. Entered service March 13, 1968. At the moment of removal from service. Last launch under combat training promoted in 1988. The SS-NX-13 submarine-launched ballistic missile was a short-range, two-stage, storable liquid-propellant missile designed for anti-ship missions. R-27K was the only in the world ballistic missile with targeting a warhead at mobile sea objects. The systems and units of the R-27K two-stage missile are practically uniform in the 1st stage engine, a missile launch system, some other components and manufacturing technology of the R-27 missile. The R-27K draft design with passive reception of radar impulses from enemy ship forces and ballistic trajectory correction with repeated ignition of the 2nd stage engine was approved. The R-27K 2nd stage engine ensured not only the traditional trajectory flight but self-guidance on a moving target with twice trajectory correction in the extra-atmospheric flight. It was capable of delivering a reentry vehicle in the 2500-lb class, containing a warhead with a yield of 2.0 to 3.5 MT, to a minimum operational range of 80 nm or a maximum operational range of 360 nm. The missile flew a lofted trajectory, and was unique in that it had an impact-point correction capability of up to 30 nm through use of a restartable second-stage. The missile used an inertial guidance system aided by an onboard passive ELINT target sensor. In a pure ballistic mode the SS-NX-13 was capable of a CEP of about 0.3 nm, and against cooperative targets, i.e., a target emanating radio-frequency transmissions, the SS-NX-13 was capable of a CEP of 0.1 to 0.2 nm. The original resolution on 24 April 1962 on the establishment of the D-5 also provided for the creation of homing missiles with warheads capable of hitting moving ships. Antiship missile variant was designated P-27K ( index GRAU 4K18). The missile was equipped with the second stage liquid rocket engine development CB-2 (chief designer Isaev A. M.). To save the missile's dimensions the size of the first stage was reduced, which ultimately led to a reduction in the maximum firing range of up to 900 km. The head part was a monobloc with a nuclear capacity of 0.65 MT. The guidance on the passive portion was carried out using passive radar seeker, a signal processing board digital computer system. Initial data for firing issued satellite system "Legend" [RORSAT] or the aviation system "Success-U". The placement of equipment system "Success" on the Tu-95RTS included under the fuselage a large radome for radar target detection (it was used to solve navigation tasks and monitor the meteorological situation), and under the cab of the navigator yhr bow antenna antenna-feeder "Harp" system (included in the MSRTS "success"), which receives a signal from an active radar homing missiles and passed her management team (to choose from and target acquisition). Four belts of rubber-metal shock absorbers were installed on the missile for safe operation. Processing data on the ship's equipment exploration Kasatka ["Killer Whale"] allowed the determintion of the coordinates of a group of ships with an accuracy of about 25 km. This data was constantly becoming obsolete - during prelaunch target location can vary up to 150 km. Therefore, the second stage control provided by the double inclusion of the propulsion system to the second stage. Initially as an option for an additional atmospheric correction trajectory to plot and features low power missile warhead. But later on this option was abandoned in favor of a purely ballistic, with high power weapons. The testing of the R-27 K missiles, which was operated on an active and passive trajectory by a passive radar vizirujushhim device on the on-board digital computer system, was conducted with PL-605 in 1969-1973. Tests of the missile system began in December 1970. The ground test cycle Kapustin Yar included 20 starts (16 of them found to be successful). Under the carrier rocket Project 605 submarine "K-102" of Project 629 was converted, with 4 missile silos on board. The first launch from the submarine was carried out in December 1972. In November 1973 tests were completed with volley fire. Only 11 launches were performed, of which 10 are considered successful. During the last laucnh the ship target was struck by a direct hit. In December 1972, a joint flight test of the D-5 missile launches was launched in Severodvinsk from the 27 K submarine Project 605. The first launch of the R-27 K with Kcvs "record-2" from the submarine Project 605 was carried out on 9 December 1972. The tests were interrupted for a short time due to the non-management of the system and resumed before the end of 1972. In November 1973, flight tests were completed dvuhraketnym salvo. A particular feature of these tests was the fact that a barge was mounted on a combat field with a large-purpose simulator, which was emitted by a missile with a passive guidance system. On 3 November 1973, a rocket from the White Sea with the submarine Loki was launched, with the Kcvs "record-2" missiles on the maximum range, with high accuracy in the sea target. The uncertainty of the target at the time of the launch of the missile was 75 km. The R-27 K rocket went through a full cycle of construction and summer work, development was brought to work and maintenance documents, and experienced shooting was carried out for surface purposes. The movement of the combat unit to the mobile targets was carried out by their radar light by a two-step outer of the propulsion station at the second stage of the flight. As sources of cursor and information for on-board equipment, the whale-B-605 was used by the "OS" spacecraft and the 95RC Air observation posts (16 p), equipped with the intelligence complex and cursor "success". A total of 11 missiles were fired from the boat, including 10 launches. The last launch has a direct hit on the target ship. The complex with the R-27 K missiles, with an estimated probability defeating the surface target with the probability of 0.75-0.8, was not adopted. In addition to the submarines, the option for the installation of the R-27 K missiles in the mid-1960s was to pursue the nuclear far zone air-defense vessel. The ship was supposed to deploy 6 missile launchers for R-27 K, 96 universal Missile kite, two systems "WASP-M", two 100-mm artavtomata, two four-tube torpedo vehicles, 15 Ka-25 helicopters. The estimated speed of the 34 of the site at the power plant capacity of 160000 HP, the autonomy of 60 days, the crew of 400 people. For the future, MSC developed a draft missile complex with an active targeting system. But the employer did not continue to work in this direction. It was not accepted. Why? The answers are different, but do not always seem to be substantiated. The main reasons for failure of this unique weapon system were two. The first was that the P-27K was supposed be carried by 667V submarine project that looked no different from the strategic missile projects 667A and 667A, and therefore, in accordance with the Soviet-American treaty SALT 1972 fall under the general classification of the strategic carriers, to which Moscow did not want. The second - from the field of "human factor", the Command of the Navy of the USSR realized that adopting the P-27K is actually crossed out plans to build ocean-going fleet. In fact, what if an enemy aircraft carriers can be destroyed with the help of submarine-launched ballistic missiles? The operation and improved antiship P-33 D-13 complex was obviously for that reason have been discontinued.